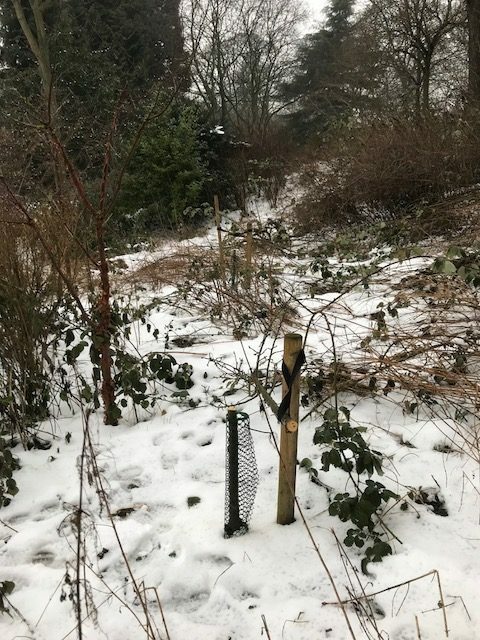 You may be aware that some nine years ago a new pond was dug in Jesmond Dene Nature Area, across the river from Pets Corner. The new pond was provided with a dipping platform to allow parties of children to dip for pond creatures. 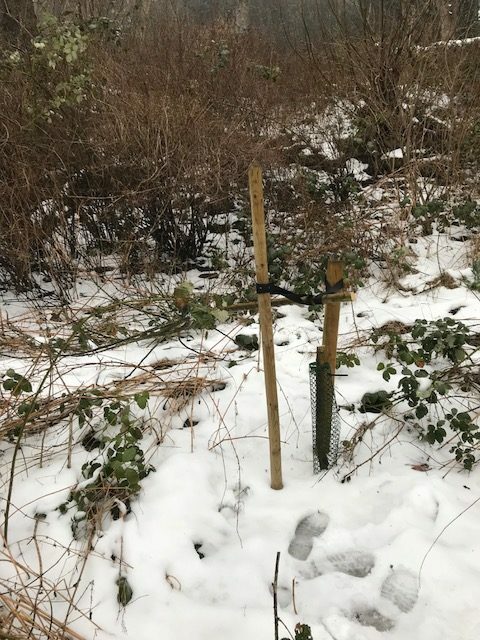 The supporting framework of the platform was made from recycled plastic, which has the advantage of not rotting, but is expensive compared to wood. The decking for the platform was made from wooden planks that we happened to have available at the time. Last year it became apparent that some of the decking planks had rotted and needed replacing. 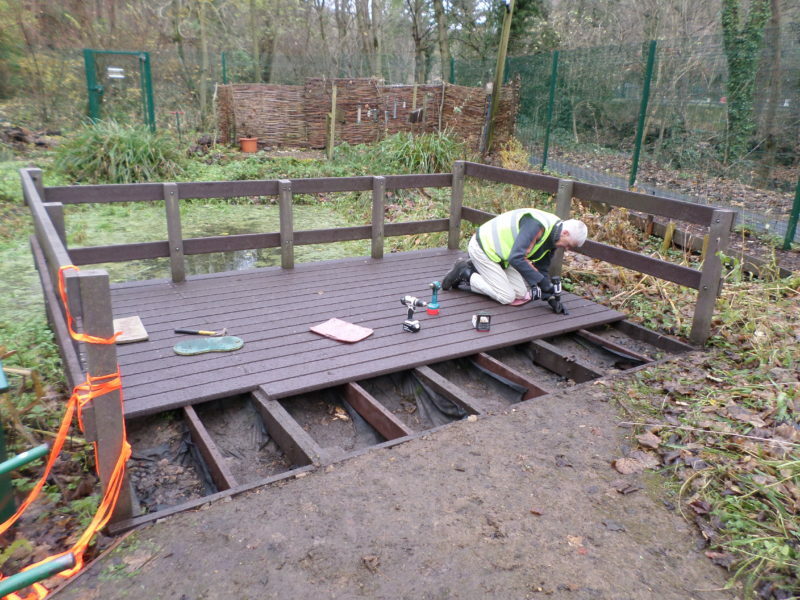 The volunteer rangers applied some temporary patches to allow the platform to continue to be used, but it was obvious that the decking would have to be replaced. It was decided to use recycled plastic for this, as the plastic framework for the platform has lasted so well. The planking cost £936.68, of which £541 was raised from the proceeds of the Christmas Raffle, with the remaining £395.68 coming from the funds of the Volunteer Rangers. Sarah, the Ranger, ordered the plastic planking and some of the volunteer rangers spent two or three sessions during December ripping up the old planking and putting down the new stuff. Apart from it being rot-proof the new planking does not need chicken wire to provide a grip as one side of the planks is deliberately roughened and plastic does not become slimy in the wet as wood does. The new decking should last much longer than the wooden planks that it has replaced. I have enclosed some photos of the decking being replaced. Newcastle City Council Cabinet has approved the creation of a new charitable company – “Newcastle Parks Trust” – for parks and allotments. Come and join us for the Big Garden Birdwatch in Jesmond Dene on Saturday (27 January 2018) from 10.30am till 2.30pm. 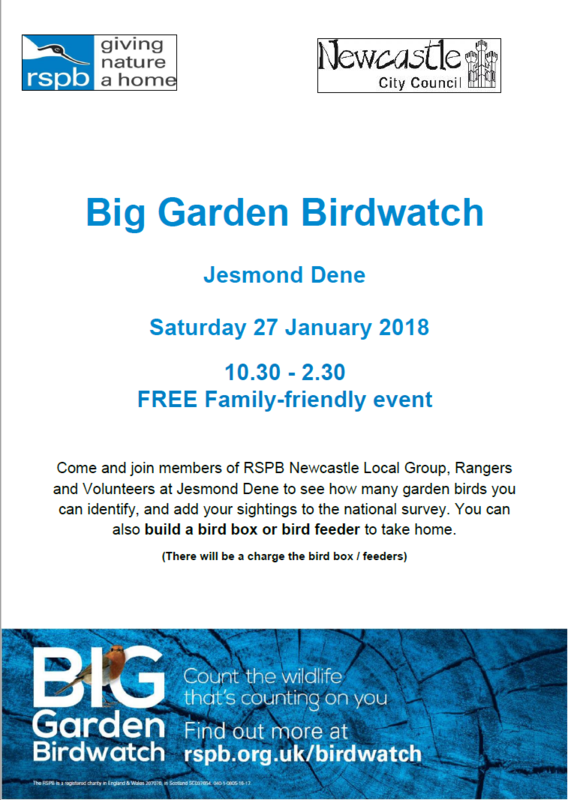 Members of RSPB Newcastle Local Group, Rangers and Volunteers will be in Jesmond Dene helping you to identify garden birds, and adding your sightings to the national survey. You can also build a bird box or bird feeder to take home. 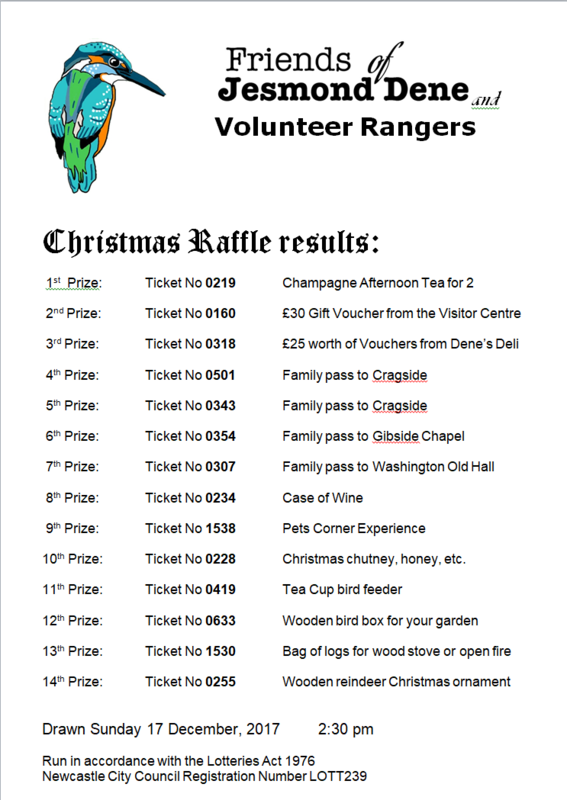 The Friends of Jesmond Dene and the Volunteer Rangers Christmas Raffle was drawn today and the winning tickets are shown below. 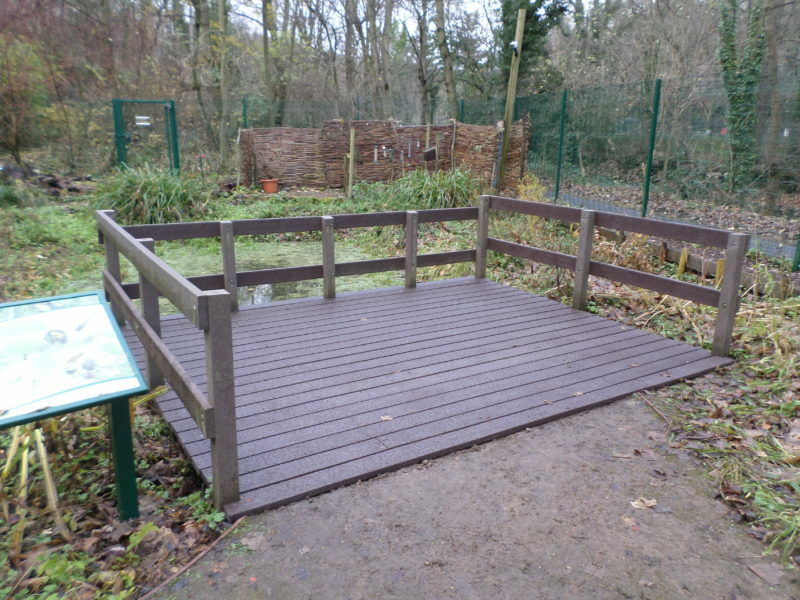 The Raffle is intended to raise funds to replace the decking in the nature area; this will make it safe for children to enjoy pond dipping for years to come. 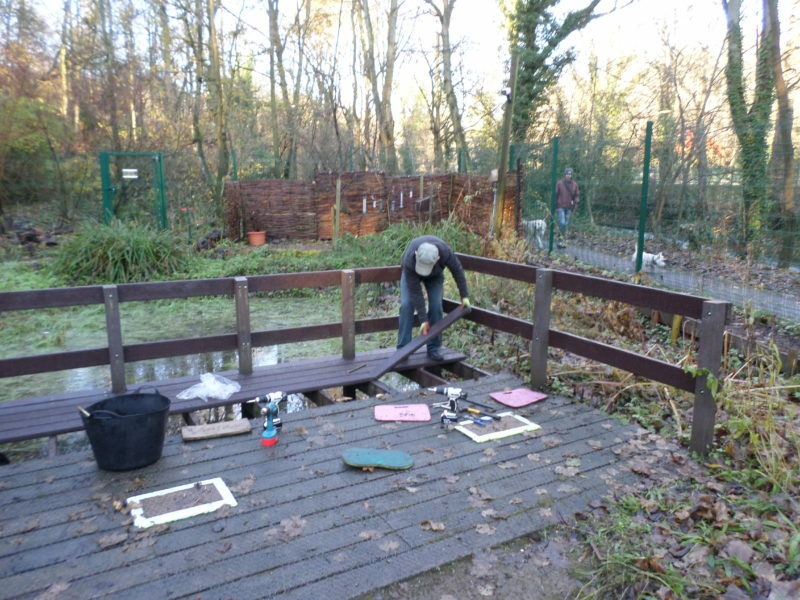 Friends of Jesmond Dene and the Volunteer Rangers are holding a Christmas Raffle to raise funds to replace the decking in the nature area; this will make it safe for children to enjoy pond dipping for years to come. The attached poster mentions some of the main prizes but other are being added. We will publish a full list nearer the draw. Tickets are £1 each and may be purchased at the Visitor Centre, Jesmond Dene (next to Millfield House Café). 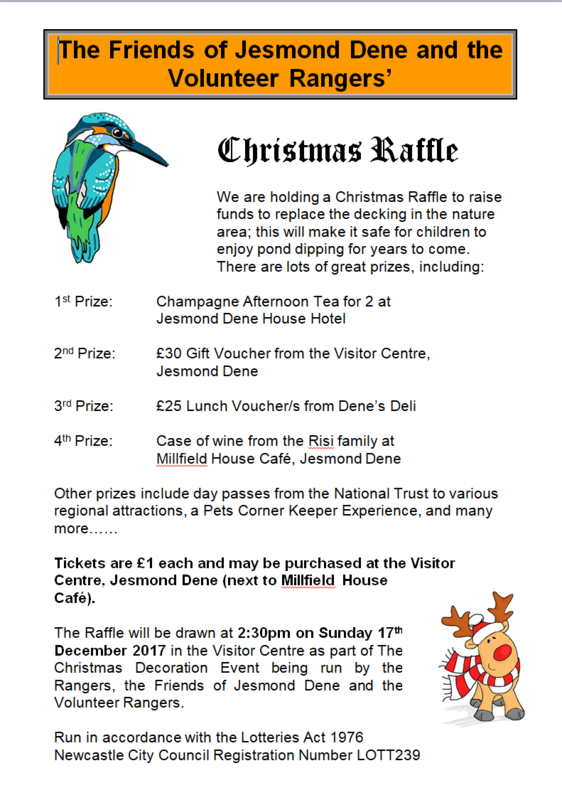 The Raffle will be drawn at 2:30pm on Sunday 17th December 2017 in the Visitor Centre as part of The Christmas Decoration Event being run by the Rangers, the Friends of Jesmond Dene and the Volunteer Rangers. Add a bit of the Dene to your Christmas Decorations this year! 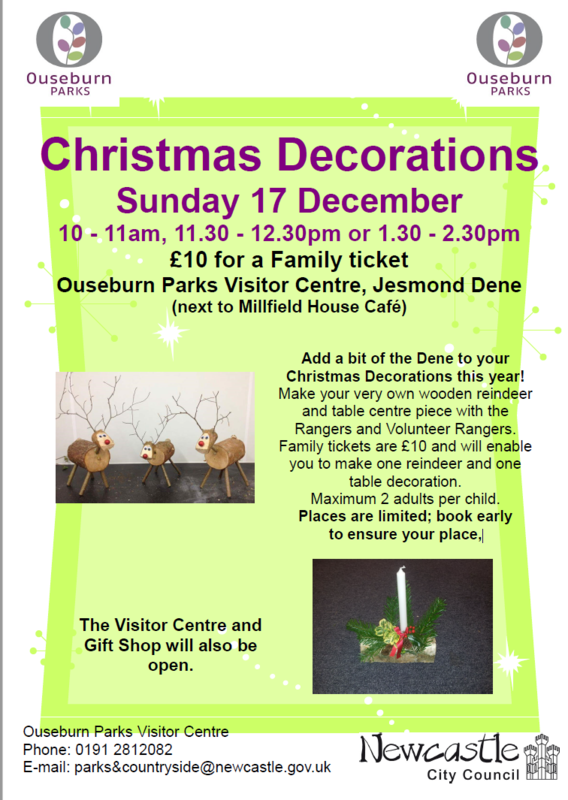 On Sunday 17 December, come and make your very own wooden reindeer and table centre piece with the Rangers and Volunteer Rangers at Ouseburn Parks Visitor Centre, Jesmond Dene (next to Millfield House Café). table decoration. Maximum 2 adults per child. The Visitor Centre and Gift Shop will also be open. Author Lynda FeanPosted on October 31, 2017 Categories UncategorizedLeave a comment on Add a bit of the Dene to your Christmas Decorations this year! 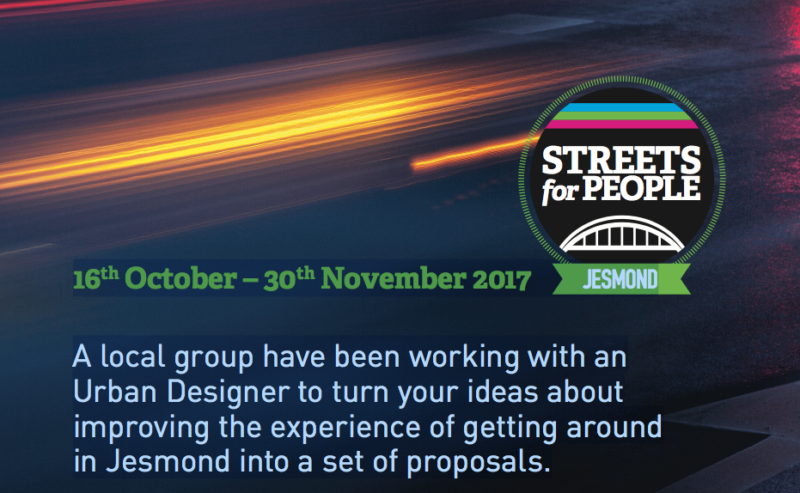 A local group have been working with an urban design consultancy to turn ideas about improving the experience of getting around in Jesmond into a firm set of proposals. And now it’s up to you to have your say. Newcastle City Council has opened a public consultation exercise which will run from 16th October through to 30th November. The ideas include new pedestrian crossings; protected cycleways; the decluttering of footways; and improving public spaces. The project is motivated by people who want children to be able to walk, scoot or ride their bikes to school, be able to play out in the streets where they live and grow up breathing cleaner air. All of this requires a reduction in the amount of motor traffic on residential streets. Detailed plans for the proposals can be found online at streetsforpeople.org. Or, you can visit the display in Jesmond Library or phone 0191 277 7681 for more information. There are proposals for Jesmond as well as Heaton and Ouseburn. The money to make these street improvements has NOT come from council tax, it’s from a national Cycle City Ambition Fund. This funding has enabled Newcastle City Council to work more intensely in suburbs close to the city centre at ways to connect the investment they have already made and add local improvements to increase the pace of change in these neighbourhoods. The council identified three project areas: Arthur’s Hill/Fenham, Jesmond and Ouseburn/Heaton areas. There will be approximately £1 million capital to spend in each project area by 2018. Stage 3: Turning the needs into proposals – Co-design with the community to develop concept design options within the scope of the project.